Armel works as a Research Specialist and also manages a photo booth business with his friends. Being a photographer was his dream ever since he was young. He always had this fascination about things that had something to do with art and photography. He was fond of tinkering their old, broken film camera, and looking at images from books, magazines, billboards and even prepaid call cards. 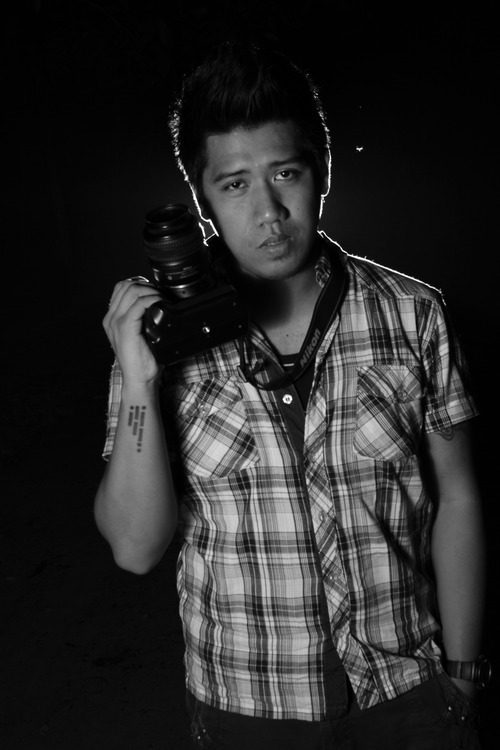 When he was in college, he joined a photo-essay competition using a film SLR camera. The photos that he submitted were exceptional. Armel's photos where artistically different from his competitors, and that alone made him win the competition. The experience made him realize that he had the ability to interpret his thoughts effectively and see things in a very artistic manner. It awakened his passion for photography, and he then promised himself that he will pursue his dream to become a good photographer. When Armel bought his first camera, he only knew the basic point-and-shoot stuff. He's learned the technicalities by reading books, watching photography tutorials online and acquiring ideas from his friends who are also in photography. In the year 2010, he started doing street photography and produced his own photo shoots. He took photos wherever and whenever he could. He learned photography mainly through experience. He is not that very particular with the technicalities or the processes of producing a photo, though he is aware that is important too. He pays more attention to the story that he gets when he looks at his photos. Armel is more concerned on how to compose his photos so that they can effectively convey the message and emotions that he wants the people to see and feel. Armel considers his first photo shoot as his most memorable assignment. Everything was in chaos on the day of the shoot. The model had a problem going to the location, and they also had to move to a different place because of the bad weather. Things didn’t go as planned. Their team decided to continue the photoshoot despite the rain. Fortunately, they were still able to produce magnificent photos. Armel realized that a beautiful picture demands a lot of hardships, trials and everything in between to be produced. Nevertheless, he could still say that the entire experience was worth his time and effort. Armel would also never forget the time when he covered a children’s party last December 2012. There was this young boy who kept on looking attentively at one of his fellow photographer. The innocence and curiosity in the boy’s eyes urged him to capture the moment. Armel loves to take candid moments of children because of the genuine and different emotions that they adorably show. It makes him happy to see random expressions of kids. Photography gives Armel relaxation. Watching different people doing random things makes him want to freeze the moment and seize it. He can see beauty and untold stories behind people’s movements. “Maybe this is one of the reasons why photography is important to me. I get the chance to steal a life's moment, to capture a spontaneity and tell a story. Photography has been a way of communication for me, more that talking or writing. It gives me the chance to tell a story, a part of me that I can’t communicate through words. It gives me a chance to share my experiences in my own way, without restricting other people from coming up with their own interpretation of the photo”, Armel said. He believes that a single photo is worth a thousand words. Every element of the photo tells a story and it can produce memories that will stay a lifetime. It can capture a moment that’s gone forever and are very impossible to reproduce. He also believes that photography is all about the message and inspiration that it aims to convey. It is about touching the emotions of people.